Mastered at Tonteknik Recording AB, Umea, Sweden. Matte finish digipack, initial pressing of 1000 copies. 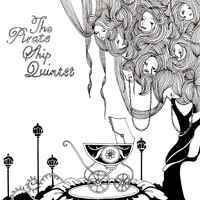 At only three tracks, The Pirate Ship Quintet's first self titled EP, progresses the future of post-rock with an incredible dynamic acceleration. Super charged with emotion, one can not help but anticipate the explosive breakdowns as they crescendo with a cello, piano, and brass. The British eight-piece "quintet" [don't ask - see their myspace explanation] is quietly straying away from limelight, but I can already predict their effect on the scene as they pick up where others have left off to carry on the baton of the genre. It is no coincidence that TPSQ shows up on my rotations within a week from Yndi Halda. Both bands seem to be at the top of my instrumental and orchestral (if you will) post-rock album lists. But the quintet is a bit darker, at times almost post-metal, with abruptly collapsing walls of sound and the following void that's filled by a sobbing cello in the corner or a lost trumpet in the woods. Recommended if you like From The Sky, Mt., Blueneck, 65daysofstatic and of course Yndi Halda. All three tracks get 5+ stars from me.